Was this man beaten in West Bengal for hoisting saffron flag on his house ? The video shows a man tied to a tree and beaten ruthlessly by a mob. This was viral last month also and is from Deoria, Uttar Pradesh. The victim asked the culprits for the money he landed them. The assaulters has been arrested by Police too. The police began investigations and arrested the prime accused, on Thursday after a video clip of the incident went viral. Six people have been arrested for allegedly flogging an 18-year-old youth after tying him to a tree in Uttar Pradesh’s Deoria district after a purported video of the incident surfaced on the internet, police said on Friday. The victim was assaulted as had reportedly asked one of the accused to return Rs 1,500 he had lent, they said. According to the police, the incident occurred on Wednesday afternoon in a village under Deoria’s Kotwali police station area. 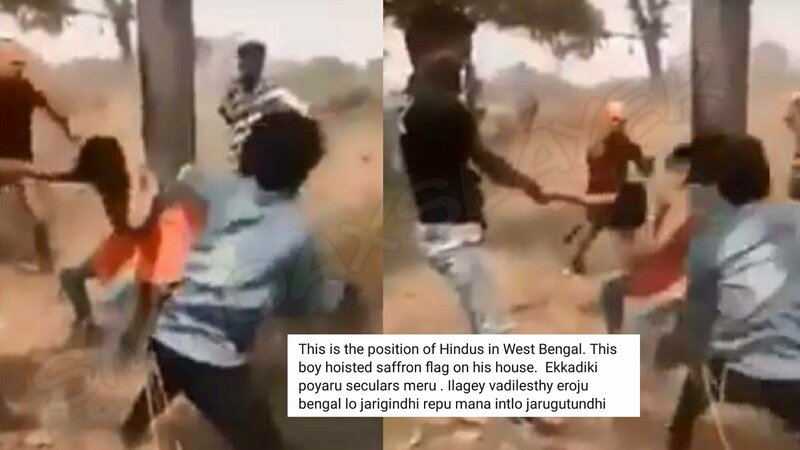 The victim, identified as Shamshad, was tied to a tree in a deserted field and brutally flogged, beaten and abused by six youths, who also recorded the incident on their mobile phones. The police began investigations and arrested the prime accused, identified as Nisar, on Thursday after a video clip of the incident went viral. Five others were arrested on Friday, while police were on the lookout for another accused. “Shamshad had lent Rs 1,500 to Nasir two months ago, which the latter had not returned. The duo had quarrelled over the issue and Shamshad had also beaten Nasir for not returning the money. Nasir avenged this beating on Wednesday,” a police officer said. He added that Nisar and his friends had lured Shamshad to a deserted field, where they assaulted him. In the purported video, Shamshad is seen tied to a tree with a orange shirt while the accused take turns to flog and beat him. One of the accused is seen twisting the victim’s arm as he pleads to be let off. “We have registered a case of dacoity and assault (in the matter). We are now looking for Vikas Yadav, who has a history of crime in the area. He is one of the main accused,” Deoria Superintendent of Police Rohan P Kannay said. “Earlier, non-cognisable report was filed when Shamshad had approached the poilce. But when the video went viral we realised the gravity of the crime and converted the report to an FIR,” the SP said. On March 20, a 28-year-old married woman, who had reportedly eloped with a youth, was publicly flogged on the orders of a panchayat in Uttar Pradesh’s Longa village. The incident came to light after a purported video of her being beaten in full public view went viral. देवरिया के रौनियार मोहल्ले में रहने वाले शमशाद ने अबूबकर नगर मोहल्ले के रहने वाले नासिर को कुछ पैसे उधार दिए थे. कुछ दिनों बाद शमशाद ने पैसे वापस मांगे, लेकिन नासिर ने पैसे नहीं दिए. इस पर पहले दोनों में बहस हुई, फिर शमशाद ने नासिर पर हाथ छोड़ दिया. नासिर ने उसे देख लेने की धमकी दी. इस वाकये को जब दो महीने बीत गए और बात आई-गई हो गई, तब 28 मार्च को नासिर ने शमशाद को किसी काम से साथ चलने के लिए कहा. नासिर शमशाद को शहर से 3-4 किमी दूर सकरापार गांव में ले गया और अपने साथियों के साथ उसे पेड़ से बांधकर बहुत पीटा. पीटने वाले लोग वीडियो बना रहे थे, जो बाद में सोशल मीडिया पर वायरल हो गए. देवरिया के इस मामले के बारे में जब हमने CO सिटी सीताराम से बात की, तो उन्होंने बताया कि अभी तक कुल 7 लोग अरेस्ट किए गए हैं. जब हमने धाराएं पूछीं, तो उन्होंने बताने से इनकार कर दिया. मामले की और जानकारी मांगने पर उन्होंने फोन काट दिया. पूरी बातचीत के दौरान सीताराम ऐसे बात कर रहे थे, जैसे वो इस केस से भाग जाना चाहते हों. अभी ये मामला पैसे के लेनदेन का बताया जा रहा है, पर जब तक जांच की रिपोर्ट सामने नहीं आ जाती, इस पर पूरी तरह भरोसा नहीं किया जा सकता. ← Unfortunately the cop died because of Dalit Protests, but the viral photos are false. Cool and Fresh Morning air, care for a GangShit ? March 15, 2019 Hoax Slayer Comments Off on A misleading letter is viral warning about Social Media posts.